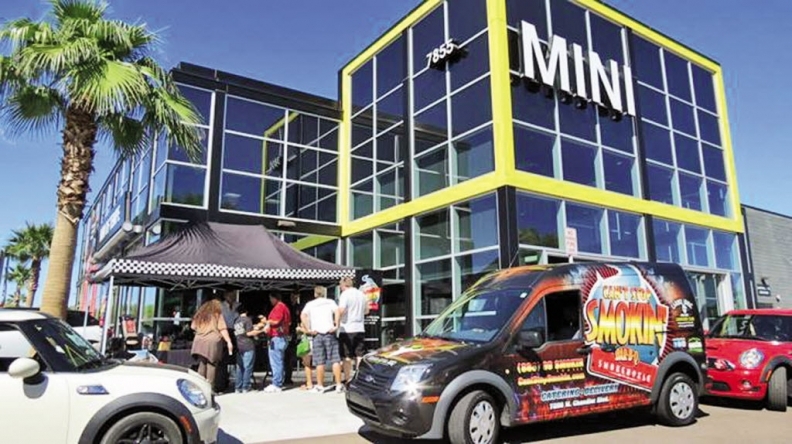 Mini, Lexus and BMW dealerships achieved the industry’s biggest improvements in building rapport with potential buyers, while Mercedes-Benz stores led the way for a seventh-consecutive year, according to a newly released study. Volvo, Smart, Jaguar and Cadillac had the largest drops in performance. 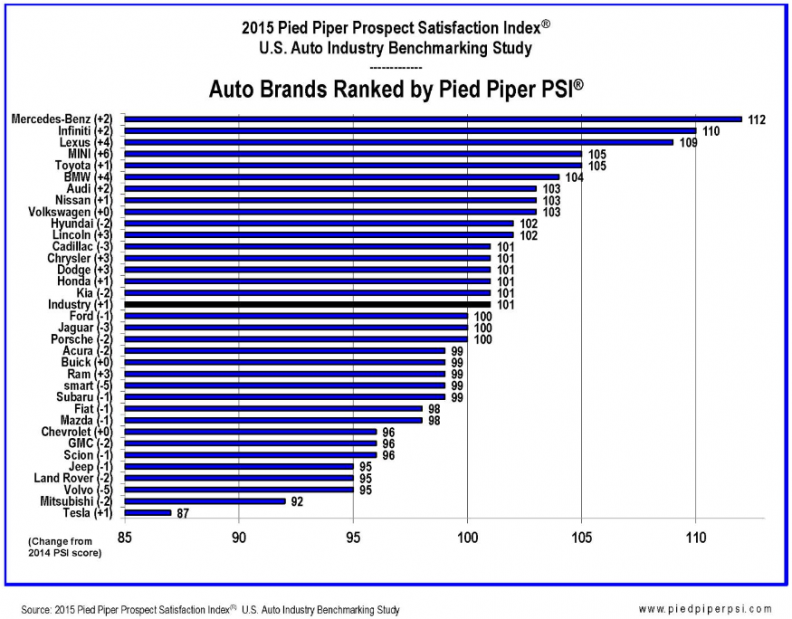 The ninth-annual Pied Piper Prospect Satisfaction Index U.S. Auto Industry Benchmarking Study measured the responsiveness of 6,370 dealerships of all major brands across the U.S. to its potential customers between July 2014 and June 2015. The scores are based on data gathered through mystery shopping. “We’re measuring how effectively a salesperson is taking a person they don’t know -- someone who’s just a shopper -- and turning them into a buyer,” said Fran O’Hagan, CEO of Pied Piper Management Co. The overall dealership score for the industry eked up 1 point from 2014, but 17 of the 35 brands had a drop in performance. Mercedes-Benz stores earned the top spot with a score of 112. Infiniti took the No. 2 spot with a score of 110 with Lexus close behind, scoring 109. Lincoln is the highest-ranking domestic brand, tied with Hyundai for seventh place. The biggest gainer in this year’s PSI study was Mini, which is part of BMW AG. Ranking ninth in 2014, it jumped 6 points to 105 to tie with Lexus for fourth. Lexus and the BMW brand were the second-biggest gainers, both increasing by 4 points. These improvements are largely a result of stores paying close attention to their annual PSI scores, O’Hagan said. Pied Piper takes more than 50 factors into account when generating a PSI score for a dealership, but O’Hagan said the most important are whether salespeople encouraged shoppers to review numbers and a potential deal, whether they mentioned availability of different financing options and whether the salesperson remembered to take down a shopper’s contact info. Salespeople tend to pull back on their sales pitch if they can feel a shopper won’t buy that day, which can be a fatal mistake, O’Hagan said. Tesla’s overall score of 87 put it far behind the rest of the field, but O’Hagan said that’s just the mark of a new brand. In fact, 15 percent of Tesla’s stores got an individual score of over 130, while 20 percent scored below 50. Tesla’s stores are different from the other brands’ on the list because the company sells its vehicles directly to customers rather than through franchised dealerships. “What we’ve found is Tesla customers love it, but the stores tend to go into what we call ‘museum curator mode,’” O’Hagan said. “Museum curator mode,” he said, is when salespeople at a dealership are not overtly rude to shoppers, but also don’t do a lot to help them become buyers. The behaviors evaluated for the PSI study are those Pied Piper has connected to a dealership’s success, not necessarily its customer satisfaction. The salesperson behaviors that were more likely in 2015 than any previous year were offers to test drive, which occurred 94 percent of the time; pitches for their dealership over others, which occurred 51 percent of the time; and initiations to sit at a desk, which occurred 83 percent of the time. Less likely behaviors included asking why the vehicle will be used, which occurred 72 percent of the time, and offering printed materials for the shopper to take with them, which occurred only 47 percent of the time.